Miramar Cove 9 is a lovely, cool and spacious ground floor unit. It is a 4 to 6 sleeper consisting of, 2 bedrooms and 2 bathrooms (one shower and one bath). 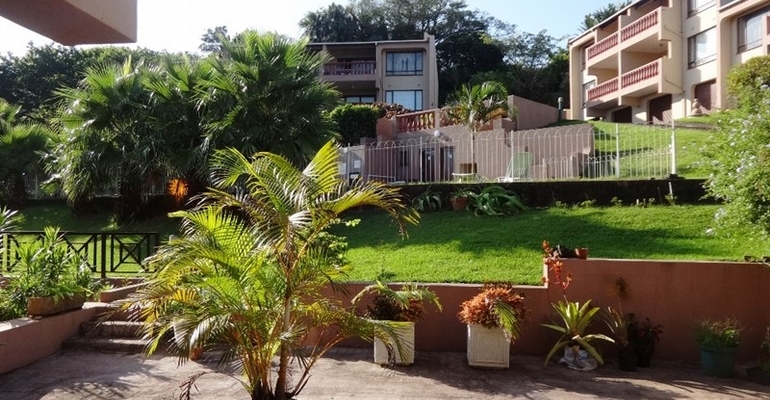 It is a self catering unit in a secure complex in Port Edward on the lower KZN south coast. Main bedroom has a double bed and is airconditioned. Second bedroom has a double bunk bed with a single sleeper on top. All the bedding is supplied. Kitchen is fully equipped and with a free-standing stove, fridge/freezer, washing machine and microwave. Spacious living room with a sleeper couch which can take two small children. Flat Screen and full DSTV package. Front verandah and courtyard. Space for the children to play and for the folks to enjoy a braai. A large fenced swimming pool which incorporates a kiddie’s pool is just a hop and skip away from the unit. A separate courtyard for all the wet washing. Just 5 minutes’ drive to the beautiful silver beach, the flat includes additional features such as full DSTV, sleeper couch in lounge which can accommodate two small children and is 10 minutes’ drive from the popular destination of the Wild Coast Sun and the water park. A family unit which comfortably accommodates 4 adults and two children. Clean and personally supervised by the owners. This is a family venue and is not suitable for loud music or parties.